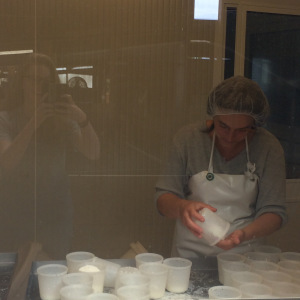 In this fourteenth edition of The Wandering Cheesemonger, our blogger on the dairy scene, Grace, heads toward the spiritual side of cheese. If I were to try and convince someone of the existence of a higher power, I would do so through the miracle that is cheese. Without prior knowledge, who could possibly imagine that the delectable morsels we snack on are created through the transformation of something as simple as milk? In my opinion, the miracle that is the creation of cheese is practically on par with Jesus’s miracle of the loaves and the fishes. Following this logic, the cheesemakers that act out this miraculous transformation on a daily basis are essentially prophets, spreading the word of good food. I may be going a bit too far with this, but the gist is that a good cheese tastes truly miraculous. The miracle worker with whom I am apprenticing right now, Marisa, makes a whole range of miracles whose flavors I will attempt to describe. Marisa’s fresh goat cheese rounds are creamy and delicate, with a light creamy flavor that dissolves quickly on your tongue, leaving you wanting more. At the same time, the large cheeses are dense and smoothly consistent in texture, perfect for eating on a crepe with honey or caramel, in a salad, or just completely plain. Her ‘demi sec’ (‘half dry’) cheese is a aged somewhere between 2 and 3 weeks, the point at which the cheese develops a bloomy rind and a gooey, sometimes almost liquid interior. The rind has a sharp, almost acidic flavor that balances perfectly with the dense and creamy paste. It’s full flavor makes it delicious all by itself, but we also sometimes cook it in to small, flakey tarts; when warm, this cheese really packs a punch. Her ‘sec’ are small ‘crotin de chèvre’, which technically translates to goat poop, but is also the name for small, well-aged dry goat cheeses. This hard cheese is extremely dry and covered on the outside with a fine, brown powder which is in fact millions of tiny spiders that work away at the cheese, lending it its unique flavor. This cheese has such a strong, sharp bite that we tell customers that it eats holes in your tongue–it isn’t for the faint of heart. Finally, her buffalo mozzarella are brilliant balls of pure heaven, spheres of rich and smoothly textured cheese from which buffalo milk leaks as you slice. The fresh flavor of the buffalo milk intertwines with the more complex curd, which has the classical gamey taste that often comes with buffalo milk cheeses.